I’m in South Africa’s Elgin Valley. The reason for my visit is this weekend’s Chardonnay Colloquium, but I’m spending five days here, aiming to get under the skin of the region and understand what’s going on. I previously visited back in 2010, just for one day. I’m not trying to visit all the producers or try all the wines. I think there’s a place for being thorough and working hard like this, but there’s also a place for just hanging out with the people, driving around, trying to get a feel for the region, and then putting the wines into this context. 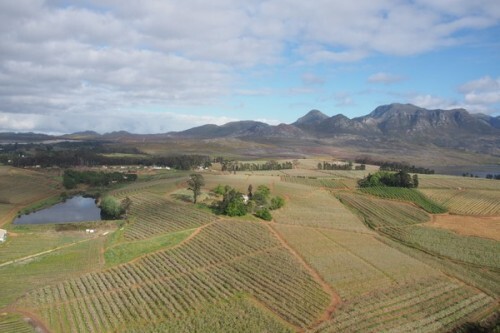 Elgin is the coolest wine growing region in the Western Cape. It’s hemmed in on all sides by mountains, and there are just four roads into the valley, all of which are passes. The best way to think of it is, as Richard Kershaw said in his talk at yesterday’s session, as a saucer. It’s an elevated plateau, with mountains forming the rim of the saucer. Within the valley, there are all sorts of exposures: lots of little hills, with very little completely flat ground. 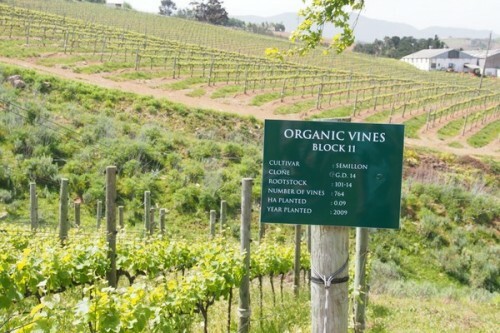 This makes for a range of microclimates, and so deciding where to put a vineyard and what to grow is a complex choice. Elgin is an apple growing district with vineyards. 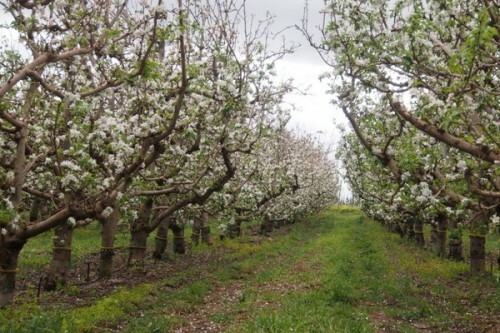 The region was first delineated as recently as 1990, and became established when apple growing was going through a tough time. 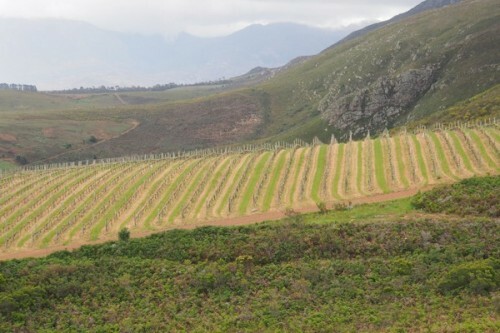 Lots of farmers planted vineyards because they thought it was a way to make money. Things have changed, and now apple growing is vastly more profitable than farming grapes. So quite a few vineyards have been ripped out and replanted with apples. This is quite a small region, but it’s capable of high quality wines. 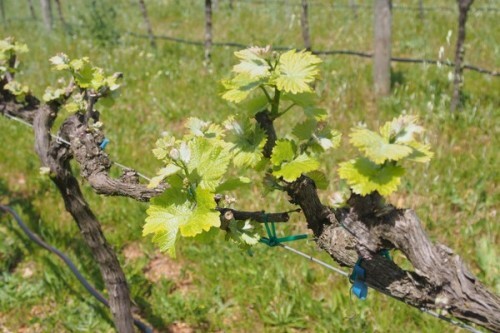 The most widely grown variety here is Sauvignon Blanc, but the most excitement is about Chardonnay – hence the colloquium. Pinot Noir is also making good progress, and there’s some fine Syrah. I’m staying with Brian and Marion Smith of Elgin Ridge. It’s been great fun to hang out with them. 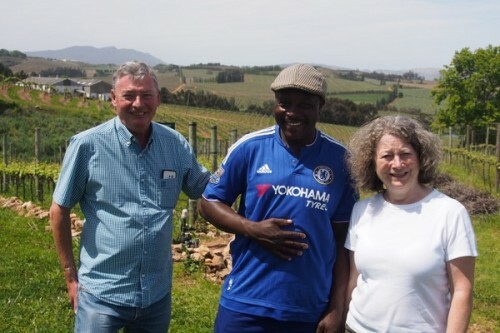 Elgin Ridge is one of the few wine farms in South Africa that is certified biodynamic (along with Reyneke and Waterkloof), and their property is really lovely. Anyway, I’ve learned a great deal over the last few days, and there’s a lot to write about. In subsequent posts, I’ll tell more. I think you are lucky to walk safely from that gyrocopter !Fyi a safe pilot means jack when the equipment is gonna choke ,sounded like that engine was close ! Cheers my 2 cents ! Thx for taking the video ,very cool spot ! Lovely to have you in the valley Mr Goode. Hope this trip brings you back to our beautifully tucked away little piece of magic more often. I’ve still got to get you to sample the magic that is Oneiric. It was a pleasure to meet you and share many a laugh with you! Have a great October and rest of the year. Always welcome here.